Like many others, Damon Maloney had seen presidential jet landings on television before. But in May, Maloney stood on the tarmac of Bishop International Airport in Flint, Michigan, where Air Force One had just landed with President Barack Obama inside, to report a live play-by-play of the president’s visit to Flint, a city crippled by a water crisis. It’s not every day that a young journalist is given the opportunity to report such a momentous occasion, and Maloney was making sure to soak it all in. Maloney, who was part of ThreeSixty Journalism back when it was dubbed the Urban Journalism Workshop, has been reporting stories for WJRT in Flint—he’s also a weekend anchor— since his arrival in November 2014, before the national coverage of the water crisis. Maloney had been part of the sporadic coverage of dirty water locally. While the issue seemed severe, any stirs of a serious problem were downplayed, according to Maloney. After independent researchers from Virginia Tech carried out tests that yielded troubling results, including drastically high lead levels in the drinking water, Maloney says, that was the moment where national media began to pour in. As a local reporter tasked with covering a national story, Maloney said the impact of this story is incomparable to his past assignments. Although reporting on the water crisis may have been challenging, Maloney says it has reinvigorated his passion for pursuing the truth. “… I think it’s rejuvenated my batteries a little bit as far as the importance of local news and the importance of holding people accountable and not just taking what they say for face value,” he said. A St. Paul native who graduated from Hill-Murray School, Maloney knew journalism was the path for him after spending two weeks at the Urban Journalism Workshop in 2001. After his two-week camp at the University of St. Thomas, Maloney spent his college years at Columbia College Chicago, where he learned the importance of professional preparation. “It was preached over and over again: you need to be prepared, there are going to be a lot of people graduating looking for first-time jobs,” Maloney said. 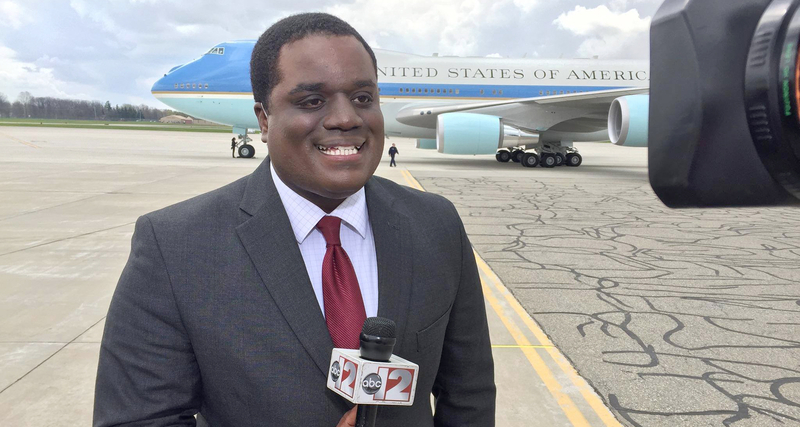 Maloney graduated in 2008, and one month later, he kick-started his journalism career as a reporter in Ft. Smith, Arkansas. He then spent four years at WKBN in Youngstown, Ohio, as an anchor and reporter, covering a range of stories, before landing his job in Flint.